Thailand’s booming tourism industry is being propped up by a rather disturbing new trend of international trafficking; not human trafficking but that of baby elephants. 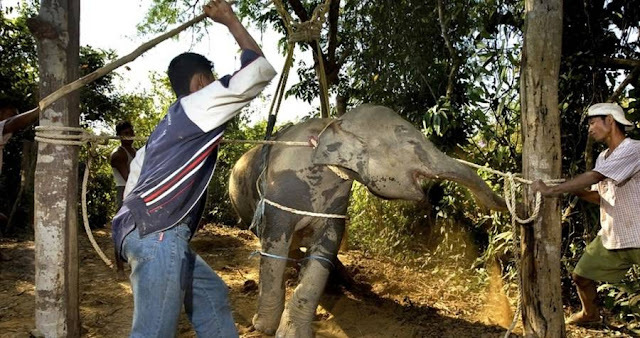 The growing popularity of riding an elephant through a jungle in this country is one of the chief reasons behind this criminal practice. The torturous journey for an elephant from a baby to an adult capable of giving rides may perhaps make you think twice before ever wanting to sit on the back of an elephant. Taking Them Away From Their Families, Baby elephants which are easier to train fetch higher prices in the black market and are therefore the soft targets for poachers. They are forcefully separated from their families by poachers who pull them out of the wild. These poachers will not hesitate to wipe out the entire family of the calf if the herd comes in their way. This is probably one of the reasons for the sharp decline in the number of Asian elephants in the wild. From a staggering 3.5 million wild elephants, the number is now down to an estimated 415,000. Over the past century, tourism and the much sought after ivory, have both contributed to the decline in the number of wild elephants. The next step after capture is ‘phajaan,’ a horrendous practice of crushing the spirit of the calf, making it totally submissive to humans. Baby elephants who are tied down and isolated in small cages are put through a horrible cycle of torture. They are stabbed with sharp objects or constantly beaten with pieces of wood to make them fearful of humans. “Imagine being a 5,000-kilogram [1,100 pounds] social animal and only being allowed to walk two steps in either direction because of a chain around your leg that digs into your sensitive skin and causes you to bleed. And now, imagine being completely alone from your family.” Says Nora Livingstone, founder of Animal Experience International. Once this training is over, baby elephants have been known to exhibit symptoms of posttraumatic stress disorder such as swaying and head bobbing. Travel agencies and animal rights groups have been alarmed by the sharp decline in the elephant population. In fact, in 2016, as many as 160 travel agencies stopped advertising these rides on their itineraries and have urged tourists to refrain from seeking out these rides in Thailand. Southeast Asia isn’t the only region responsible for this decline in the elephant numbers. The practice of senselessly killing these animals to satisfy human greed is common all over the world. Although the demand for ivory has been one of the biggest factors responsible for the decline in these populations in Africa, the practice of training elephants for rides is catching up in this continent too. The next time you want to see an elephant in the wild, visit a reputed sanctuary where the animals are not subjected to any inhuman treatment.